Growing strawberries gives you a beautiful supply of the fresh summer fruit right at your fingertips. Lovers of full sunshine, strawberries are relatively easy to grow in looser soils – in fact, they can be a little aggressive if you’re not careful. 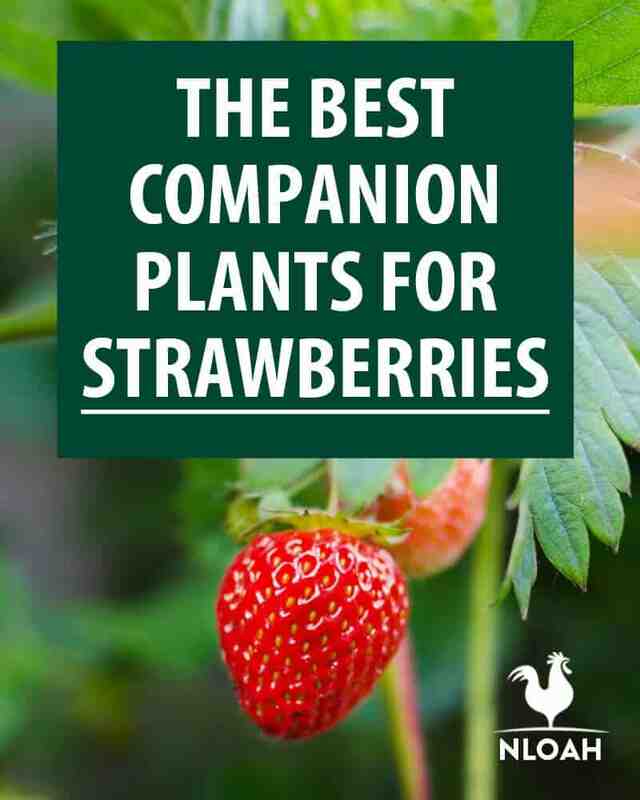 In this respect, when planting companions to strawberries, you have to consider both what works well with strawberries, and what strawberries don’t work well with. The thing is, that companion planting isn’t as simple as just planting something next to strawberries that helps them grow. There are many facets to this technique that will truly allow your strawberries to flourish, including improvements soil quality, sun exposure, yield productivity and so on. First, let’s get a little background as to what companion planting is. Like a human companion, companion planting is a way of intercropping that enables neighbouring plants to support each other in becoming the most productive they can be. Companion planting is about purposely planting certain species of plants and veggies next to each other to improve the condition in which they’re growing. Companion planting can have a number of benefits. Firstly, by positioning certain flora next to each other, you can improve the yield, allowing the place to grow more productively. Equally, you can enhance the flavor of your strawberries with the planting decisions you make. Often, many permaculturists and gardeners use companion planting as a method of integrated pest control. Where some species of plants work well to attract beneficial insects, others work to deter pests that can damage your crops. On a more physical level, you can arrange your crops to give each other support in more tangible ways. For example, in the most famous crop arrangement, used by Native American farmers – the Three Sisters – corn is planted to act as a trellis to support bean growth. Moreover, taller and stronger plants can be used as sun shelter to plants that need shade, and wind shelter to those that are slightly more delicate. You’ll also find you can sow certain species for weed suppression, to stop your crops getting tangled up in unwanted aggressive pioneer plants. In terms of soil improvement, you can improve the levels of nitrogen in the soil for more productive growth by planting nitrogen fixers, like legumes. What’s more, dynamic accumulators – plants with long taproots and big leaves – work to pull minerals from deep in the soil, and then introduce these minerals to the top of the soil when their leaves fall and decompose into the topsoil. When you’re companion planting anything, you need to consider all aspects of the plant’s growing preferences in order to find the most suitable companions to match its needs. With strawberries, it is vital to remember that they can be relatively aggressive. In this respect, you need to choose plants that won’t get strangled or pushed out by your strawberries as they run wild along the floor of your beds. Strawberries like full sunshine, so make sure you’re not planting anything too tall that will block out the sun. When doing this, you need to consider your spacing over time. For example, while you may plant a small thyme bush next to your strawberries, over time the thyme will spread out and grow taller and could block the sunshine. If you’re planting slightly larger crops near your strawberries, plant them to the north of your strawberries so as to not block the sunshine. The same is true the other way round; if you’re planting small sun-loving ground cover next to your strawberries, plant the strawberries to the north of these. Strawberries like slightly acidic soil, around a pH of 5.5 to 6.8. Nitrogen fixing plants, such as beans and peas, will lower the pH of the soil, as will evergreen trees, such as pine (as pine needles drop to the floor and lower the acidity) – remember not to plant the trees in front of the sun! Lastly, when planting strawberries, consider that they like loamy soil and should not be planted in heavy clay soils or places without good drainage. 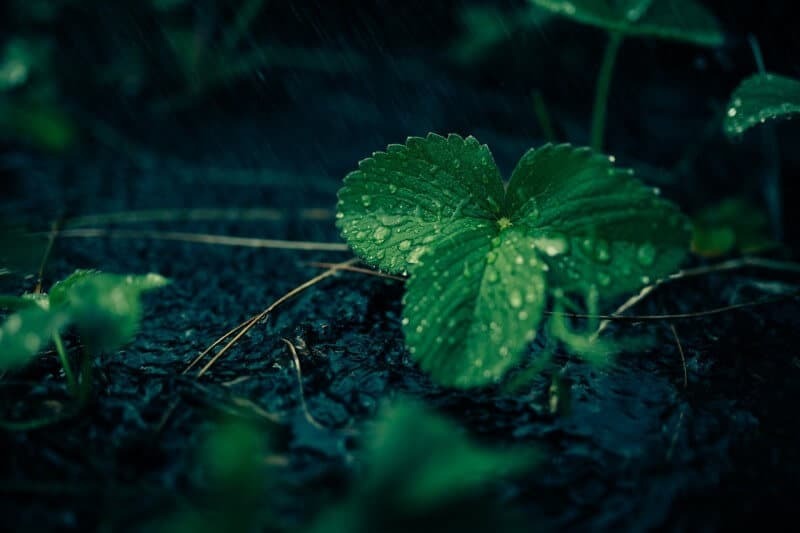 With this in mind, choose supporting plants that also like loamy soil, or ones that have complex root systems to break up the soil and improve drainage. Below is a list of companions for strawberries that help with improving the productivity and flavor profile, assist with integrated pest management, and refine the physical environment. Firstly, it is important to make a note about borage as it is perhaps the best companion for strawberries. Borage has a special relationship with strawberries, helping it in numerous ways. First off, many strawberry cultivators swear by borage as a flavor improver for strawberries, giving them a sweeter and fuller taste. When gardeners plant borage near their strawberries, they often find that the strawberries are far more productive, producing significantly higher yields with juicier fruits. This could be for a number of reasons. Borage is known as a dynamic accumulator. It mines minerals from deep in the soil, sucking these nutrients up into the big leaves (the leaves can be used as wraps to reduce inflammation). As the leaves drop, these nutrients are released back into the topsoil. To improve this process, you can chop and drop these leaves on to the top of the soil to release even more nutrients at a faster rate. Borage also works with your integrated pest control as it produces small blue flowers (that are edible and taste like cucumber) – these flowers are favorites for all kinds of bees. As bee hotspots, they work a pollinator attractors, which help to pollinate more strawberry flowers, increasing the yield. Equally, borage attracts beneficial insects that work as predators to pests that harm strawberries. In particular, borage attracts praying mantises that eat aphids, caterpillars, and beetles (beetle larvae eat the strawberry roots), and predatory wasps that eat caterpillars. Remember that borage can grow quite large, so you you need to plant it to the north of strawberries. Bush beans – Relatively easy to grow, bush beans are nitrogen fixers that take nitrogen from the air and release it back into the soil. This improves the soil quality, lowers the pH of the soil, and increases the productivity of strawberries – making them grow fuller and faster, with higher yields. Lupin – Lupins are also in the legume family and work as nitrogen-fixers. Remember that while they are edible, they need to be prepared correctly or they can be toxic. Often they are washed with a great deal of water and then pickled. The plant itself is often used medicinally for urinary tract infections. Lettuce and Spinach – Both of these leafy greens are often intercropped with strawberries as this triad increases the productivity and yield of all three. Bush Beans – Bush beans also work as a repellent against harmful beetles whose larvae eat the roots of strawberries. Caraway – Caraway attracts parasitic wasps who lay their eggs inside the bodies of strawberry pests – namely aphids, strawberry sap beetles, and root weevils. Garlic and Onions – Garlic and onions work by repelling certain insects due to the chemical that produces their strong scent. Both of these will repel aphids, flea beetles, and weevils. Thyme – Thyme is a great companion for repelling worms in your strawberry fruits. It also attracts hover flies that eat thrips, aphids, and caterpillars. Dill/Fennel/Coriander/Sage – All of these herbs will deter slugs from eating your strawberry plants. This is especially important when first planting strawberries. French Marigolds – Marigolds contain toxins called thiophenes in their roots which kills certain harmful nematodes in the soil. For strawberries, root knot nematodes are especially dangerous and marigolds help to kill these off. French marigolds are a better choice than Mexican marigolds, as the toxins are far stronger in the Mexican variety and can harm the strawberry roots. Asparagus – Asparagus contains the same toxin as marigolds and therefore works in the same way. While some plants work well with strawberries, others are either harmful to strawberries, or they are stunted by strawberry plants. Brassicas – The Brassica family – which includes cauliflower, broccoli, collard greens, brussel sprouts, and kale – are stunted in growth by strawberries. You’ll find that the aggressive nature of strawberries impairs the productivity of your brassicas. Verticillium – Verticillium is a type of fungus that causes Verticillium Wilt in certain susceptible species. While some of these plants can survive a little wilting, their presence encourages the fungus which is deadly to strawberries. If you grow strawberries in soil where these susceptible plants have been, you run the risk of infecting your strawberries and killing them off. This includes tomatoes, potatoes, melons, pumpkins, eggplants, sunflowers, dahlias, roses, mint, okras, blackberries and raspberries, and grapes. Instead, wait five years before planting strawberries in these areas. Strawberries are pretty easy to grow. They like full sun and slightly acidic, loamy soil. When planting companions, look for plants that attract pollinators and predatory insects that repel beetles, worms, and aphids. Nitrogen-fixers really help to improve the productivity and yield of strawberries, but try not to plant bean trellises that block out the sun. Remember that strawberries will damage your brassicas, however. Equally, keep strawberry plants clear of verticillium susceptible plants, or they’ll die out before they’ve managed to bloom. Keep all that in mind, and you’ll have overflowing strawberry plants that give you full, sweet fruits in abundance, all summer long and into the fall. We were just going to get some strawberries to plant this afternoon! So glad we stumbled onto this article. We need to change some things in the area we wanted to plant them… And maybe get some garlic to go along with.